Following the recent release of Sting’s highly anticipated rock/pop album 57th & 9th and with sold out concerts already confirmed in North America and Europe, Cherrytree Management and Live Nation Lushington are proud to announce the return of English singer-songwriter STING, performing live in Hong Kong on 3 June, 2017 (Saturday) at the HKCEC, HALL 5BC. Ticket from HKD588 will be available via HK ticketing on 13 January, 2017 (Friday) from 10am onwards. Members of the official Sting fan club will have the opportunity to purchase tickets in advance, from 6 January (Friday), 10am to 7 January (Saturday), 11:59pm. Members of HKT, The Club will have the opportunity to purchase tickets prior to public on sale date, from 9 January (Monday), 10am to 10 January (Tuesday), 11:59pm. For membership sign up & enquiries, please visit https://www.facebook.com/TheClubHongKong. Live Nation Lushington member can pre purchase on 11 January (Wednesday) as well from 10am to 11:59pm. For membership sign up & enquiries, please visit www.livenationlushington.net. On the 57th & 9th Tour, Sting will be joined by a 3-piece band including his longtime guitarist, Dominic Miller, plus Josh Freese (drums) and Rufus Miller (guitar). Special guest in Hong Kong will be singer/songwriter Joe Sumner. 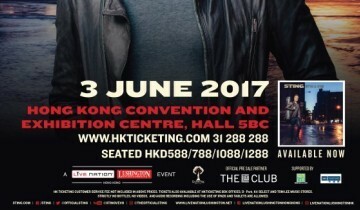 Performing live in Hong Kong on 3 June, 2017 (Saturday) at the HKCEC, HALL 5BC.